An accelerating intermedial turn in Shakespeare production has made itself felt in forms and formats ranging from the use of video projection in/as stage scenography to digital performance-capture techniques that produce holographic characters onstage. The first half of this chapter concentrates on two recent productions—Thomas Ostermeier’s Richard III and Romeo Castellucci’s Julius Caesar. Spared Parts—that embrace intermediality but demonstrate as well the turn to embodiment that predates, and may well postdate, emergent intermedial trends. 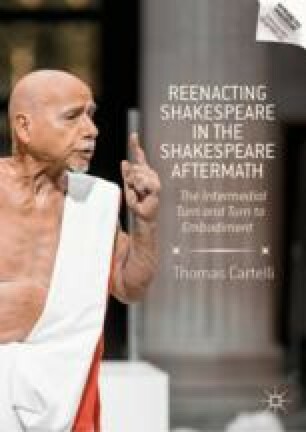 The chapter concludes with a sustained case study of the provocative face-off between New York’s Wooster Group, representing the American theatrical avant-garde, and the Royal Shakespeare Company, established keeper of the Bardic sacred flame, in their collaborative production of Troilus and Cressida at the 2012 World Shakespeare Festival.